The Jay 2 wheelchair cushion is a soft, mildly contoured foam cushion designed to provide both provide stability and comfort. Particularly suitable for the person with a flexible posture at low risk for skin breakdown, it has a firm base with anatomical well. It is bevelled to fit between the seat rails on wheelchairs with seat upholstery, but provides a level support surface. Mild contouring is provided by durable moulded foam which assists with postural stability and sitting tolerance. The stability provided by the Jay 2 also helps reduce sliding and shearing. 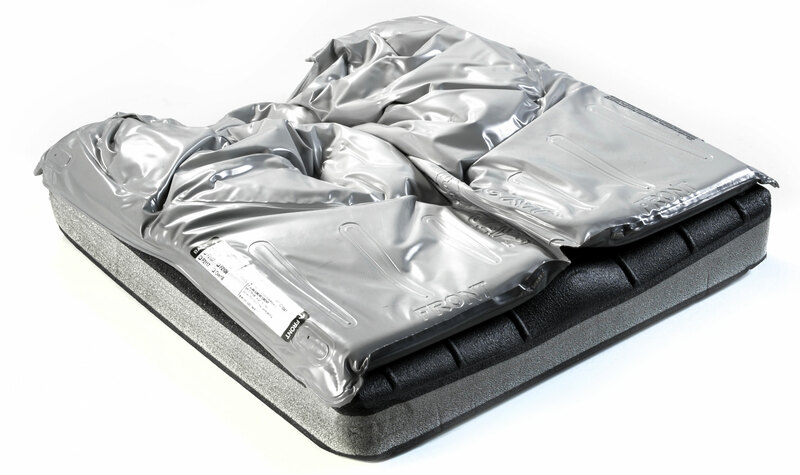 The J2 cushions feature a contoured foam base constructed from closed cell foam. This makes it easy to modify in our factory or in the field. Additionally, an extensive selection of positioning components are available. The J2 cushions provide exceptional lateral and forward stability for individuals with changing needs or unique postures. J2 cushions are available with the choice of three cover options - Stretch (allows for proper immersion and prevents the increase in pressure resulting from surface tension), AirExchange (promotes airflow and dissipates heat and moisture to keep the surface and the client clean and dry) and Moisture/Incontinence-Resistant (pictured, helps with incontinence management by protecting the foam base from moisture build-up).